As there was no pre-arranged subject, this became another "show and tell" session - though not everybody had brought along something suitable. 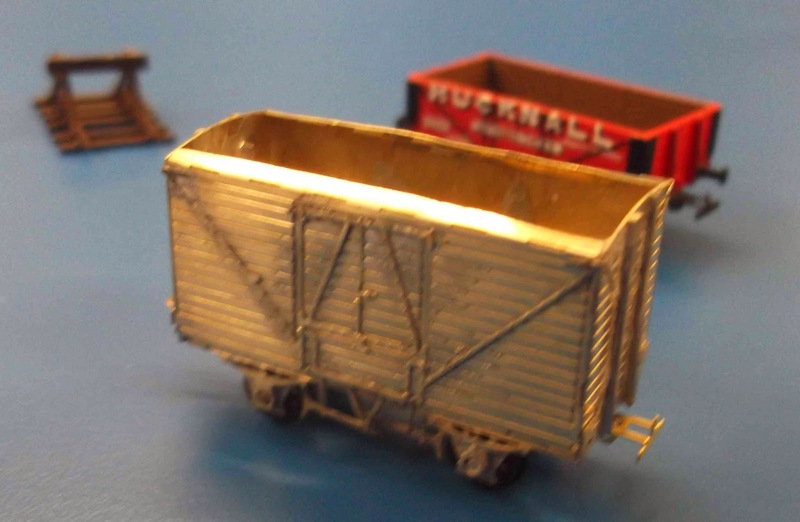 Justin brought along a mostly-completed two car multiple unit, of etched brass with resin roof. The main unfinished part being motorising it - prompting a discussion of how best to adapt the drive system of a Dapol 101 to fit. Gareth had a selection of projects to display. 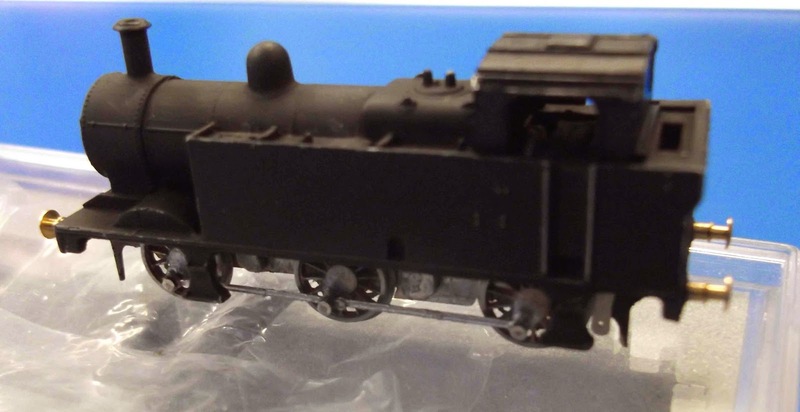 There was an almost-finished Jinty, using the Association replacement chassis, and extensively packed with lead to produce a surprisingly heavy little locomotive. Still at the "How do I do the rest of it?" 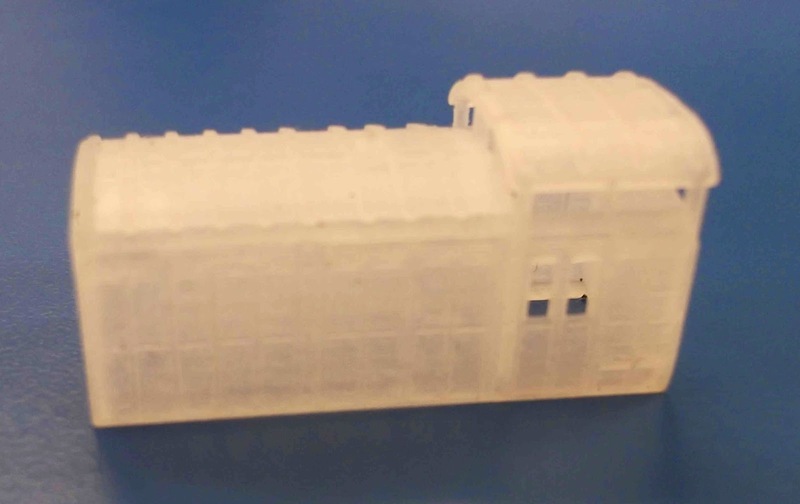 stage was the body of a 3-D printed birdcage-style North London Railway brake van from Etched Pixels (Alan Cox). 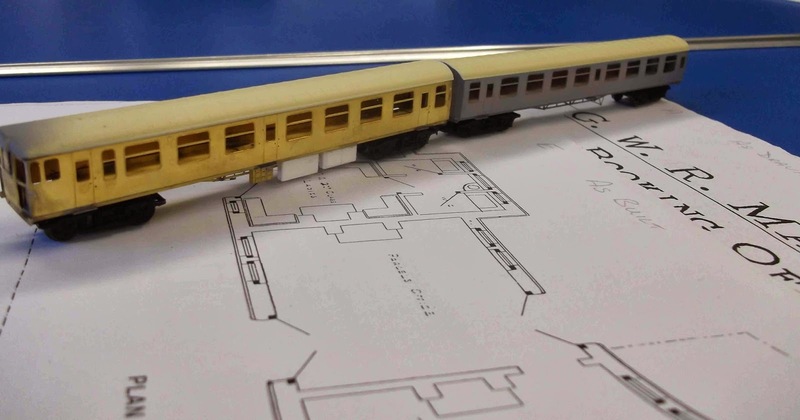 It is designed for N Gauge modellers, intended to fit on a Peco 10 foot wheelbase wagon chassis. Also a mostly-finished Association LNWR van, some buffers, and various converted proprietary wagons. The latter part of the meeting developed into a discussion about the possibility of having a small layout for the group to work on. Richard Wilson offered his “Maxstoke” layout, but it wasn't obvious how to handle access to this layout as he lives well away from London. This is a small station on a single-track Midland Railway line between Birmingham and Derby, set around 1910 to 1920. There was much discussion about the possible traffic patterns – with the centenary of the Great War bringing out some special commemorative packs, ambulance trains, munition trains, and tank trains were mentioned as possibilities. Gareth took us down to see the MRC EM layout “Empire Mills”, which is broadly similar to Highbury Colliery in design, with the thought that in 2mm it would be a fairly manageable size (about 6 feet long including fiddle yard, and about 18 inches deep). By having a goods-only shunting plank it could be made relatively independent of area and era, and therefore potentially of interest to all. The first step is to ascertain whether there is enough interest among the members of the group to proceed any further. Subsequently, or perhaps simultaneously, we need to try to reach agreement on the layout itself.